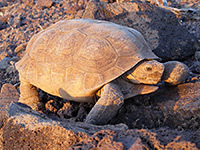 496,600 acres of cactus plains and rugged mountain ranges southwest of Phoenix became, in 2001, the Sonoran Desert National Monument, one of four new BLM-administered zones in Arizona. Unlike NPS national monuments, the Sonoran Desert has very few facilities and no central attraction; its purpose is mainly to protect the historic sites, Indian relics, native habitats, vegetation and wildlife rather than attract visitors. The designated area spans 25 miles of land either side of interstate 8 (see map), with about half to the south, comprising the Table Top Wilderness, Vekol Valley and part of the Sand Tank Mountains, and half to the north, centered on the North and South Maricopa Mountains Wilderness. So now almost all of the Arizona desert south of I-8 is protected or used in some way, either within Indian Reservations, the Luke Air Force Base, or preserves of the NPS and BLM. There is however plenty of empty Sonoran desert in the state that still has no special protection beyond existing wilderness areas, between I-8 and I-10, and between the Colorado River and US 95, land which is just as scenic as this new monument. 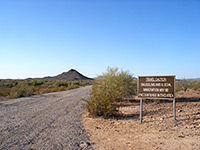 Interstate 8 is the main highway through the Sonoran Desert National Monument, and exits 151, 144 and 140 allow access to the backcountry via a network of rough tracks. Another entrance route is the little traveled Maricopa Road (AZ 238) between Maricopa and Gila Bend, which parallels a railway, running between the two sections of the Maricopa Mountains. Apart from these two, only dirt roads cross the desert, all of which may require 4WD in some places or at some times of year. 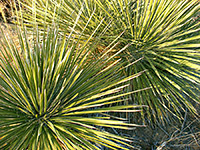 Besides the obvious dangers due to the remoteness, rough terrain, spiky plants and extreme summer temperatures, the area is also affected smuggling and illegal immigration, but despite the emptiness, the desert is not completely undeveloped as there are several maintained trailheads in the pre-existing wilderness areas, and BLM rangers now patrol the back roads quite regularly. of Vekol Valley - sandy, level land bearing scattered bushes, palo verde trees and cacti. To the east are the Table Top Mountains, rising to a high point of 4,374 feet at Table Top itself, a flat topped volcanic summit, and one of the few locations with a recognised trail. 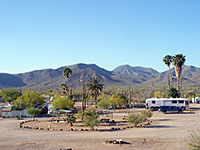 The trailhead is reached by taking a left turn 6.8 miles from the interstate then driving another 4.5 miles along a rather rougher track, and has a small parking area plus a three site primitive campground. The trail is 3.5 miles (one-way), climbs over 2,000 feet and has panoramic views over the surrounding desert. One other maintained path (Lava Flow Trail) traverses the western slopes of the mountains, in places over basalt rocks and lava, though mostly over dry washes and through bushy flatland. It has three trailheads, one along the Table Top road, the other two reached from side tracks of Vekol Valley road. On west side of Vekol Valley are the cactus-covered White Hills, which are quite close to the road and so are good for short off-trail explorations, then beyond are the much larger Sand Tank Mountains, most of which are owned by the military and require a permit to explore. A little further west, I-8 exit 140 is the start of another long, rough route (Freeman Road) into the monument backcountry, leading to various sites in the White Hills and the Sand Tank Mountains. There is also a short, disused gravel track running parallel to the interstate and about half a mile from it, which makes a perfect place to camp - out of direct sight from the highway, and overlooking large areas of roadless saguaro forest. The land nearby is flat apart from a small solitary summit (Lost Horse Peak) one mile south, reachable by an easy walk across the open, stony ground followed by a short climb up the rocky slopes. The top of the peak is well defined so there is nothing to block the 360-degree view over the surrounding mountains and plains. The section of Sonoran Desert National Monument north of the interstate encloses the two ranges of the Maricopa Mountains, and is bordered by AZ 85 to the west and Little Rainbow Valley in the northeast. Besides the desert and mountain scenery, this contains a section of the Anza National Historic Trail, and like the southern portion, has two recognised paths (the 6 mile Brittlebush Trail and the 9 mile Margie's Cove Trail), both in the Northern Maricopa Mountains Wilderness. 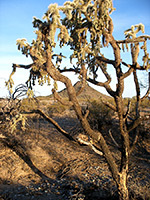 The Southern Maricopa Mountains Wilderness is the most remote in the national monument, with no trails or 4WD tracks. 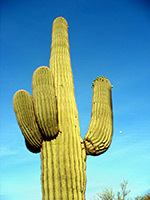 The nearest towns with hotels close to Sonoran Desert National Monument are Gila Bend on the west side and Casa Grande to the east.